...until we get confined to social norms that we wish we didn't have to abide by and then we love to say things like, "I can't wait to get old so I can do whatever I want." Because let's face it, old people can get away with pretty much anything. There is an unspoken rule that once your skin starts falling off your face, smacking a random in the leg with your cane for no reason, yelling at children on the street and wearing a nightgown to the grocery store are all acceptable forms of daily existence. While all of these things are terrible (yet incredibly hilarious), one of the most unfortunate things about elderly ladies is Talbots...and general old lady 'fashion'. In any demographic or grouping however, there are those that break the mold. For the longest time I thought there were two types of old ladies - those who didn't give a damn and wore bag like clothing and those who wore Talbots (or some similar variation of old woman beige). Enter Ari Seth Cohen and his elderly fierce friends. 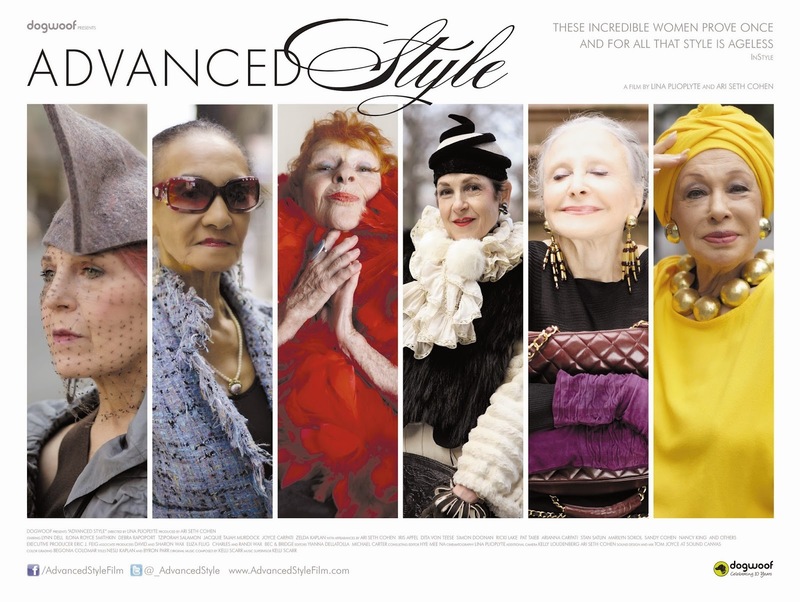 The documentary, which was screened at the Calgary International Film Festival, takes a look into the lives of a handful of women who are regularly featured on Ari's blog, Advance Style. They live in New York City and always leave their homes dressed for fashion week. The film gave us a peek into the lives of these ladies. Where did they come from, what had they done and what are they doing...and most importantly, why do they love fashion? One of the ladies said that she was an artist, and dressing up was just an extension of her art - she was the canvas. Another said that it takes her years to get an outfit together - each piece needing to be perfect before she presented it to the world. And one said that she gets dressed up everyday for the theatre of her life. And that makes sense, because these ladies were definite characters. There is so much to say about this film. It was not just a story about some old ladies that like to wear fabulous clothes. It was a commentary on getting old. It was a PSA about a movement...a movement that recognizes old people as still being relevant to fashion - an industry obsessed with looking young. And mostly, it was a love letter to being yourself. I left the theatre thinking that getting old may not be as bad as I thought. As long as I know me, and do me, I'll be good with the rest of it. I am not a huge fashion person so I won't be turning my hair into fake eye lashes, but I will most definitely own it when walking* down the cereal aisle in a nightgown hitting random children with my cane for no reason. *I also don't know if I will really be into walking when I am 80. I may be doing all of this while riding a scooter - or a segway.